The Roswell Klal Yisrael Fellowship is a year-long partnership program of the World Union for Progressive Judaism (WUPJ), in collaboration with the Union for Reform Judaism (URJ), the Global Leadership Institute of the Jewish Agency for Israel, and the Israel Movement for Reform and Progressive Judaism (IMPJ). Its aim is to cultivate the leadership potential of young adults, ages 20-26, from around the world as they continue to take part in building, strengthening, and determining the character of their Reform and Progressive Jewish communities. The program kicked off in December 2016, with the 2016-17 fellows, comprised of a diverse group of 22 enthusiastic young adults from eight countries, beginning the year with their first seminar in Jerusalem in December. 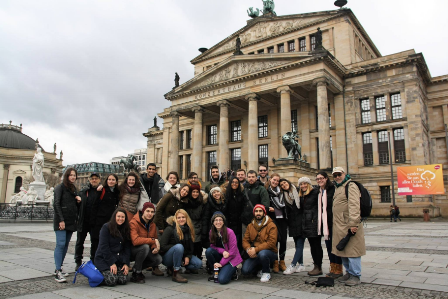 Between March 19-26 the group converged on Berlin for a week of training, touring, education, exploration and communal growth. Rebecca Bigman, Israel Engagement Manager for the URJ, provided this first-hand account and report of highlights and reflections on the week. We are happy to report back after a successful Roswell Klal Yisrael Seminar in Berlin. This year’s cohort of fellows has continued to expand their knowledge and understanding of global Jewry and to grow as leaders in the Progressive Jewish community. Shabbat with a young adult alternative prayer group, Let’s Start Davening (LSD) that creates their own unique Friday night experience, Roswell Klal Yisrael fellow Didi Poliak writes, “While some of the melodies were different than the ones I knew, it was so special to feel the power of the songs and the prayers within this Progressive community. I loved that every person had the chance to lead a song, prayer, or share his or her thoughts if he/she wanted, and the community as a whole was so spirited! We could not have asked for a better Shabbat evening experience in Berlin or a better community to share prayers, songs (especially Shalom Aleichem) and wine with! The Ernst Ludwig Ehrlich Studienwerk (ELES), named after the renowned historian, is one of thirteen scholarship programs supported by the German Federal Ministry for Education and Research. It provides scholarships for gifted Jewish students and doctoral candidates. 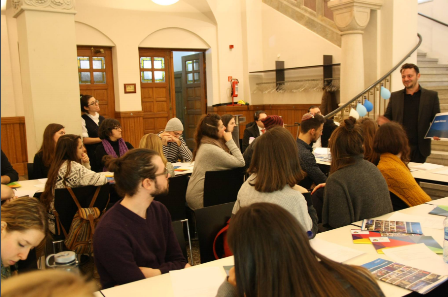 Launched in 2009, ELES pursues the goals of strengthening Jewish identity, sense of responsibility and dialogue capabilities among its over 400 scholarship holders, who are thereby encouraged to actively shape the future of the Jewish community in Europe. Special thanks to Betty and Arthur Roswell for their generous support of this program. In August, the Roswell Fellows will next meet up in New York for their third and final group experience. Please fill out this form to share "Roswell Klal Yisrael 2016-17 Fellows Hold Seminar in Berlin" via e-mail.